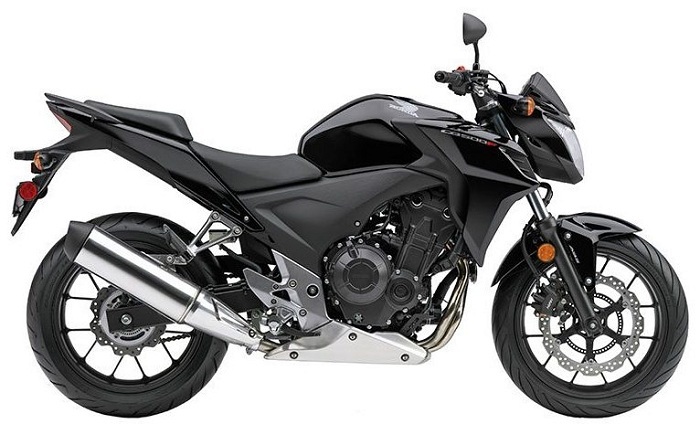 Affordable, practical and fun to ride, the CB500F ABS is a breathtaking sportbike motorcycle for any adventure you embark on. Its 471cc twin-cylinder powerplant supplies superior performance and handling. The street bike motorcycle’s neutral, classic seating position makes it a perfect fit and versatile ride for people who want a machine that can do it all and do it well. Plus, the available anti-lock brake system (ABS) on the CB500F ABS helps you make smoother, more controlled stops in poor weather and road conditions. Anti-lock brakes reduce brake pressure when they detect impending lock up and increase pressure again when traction is restored. Brake pressure is then evaluated multiple times per second, so sportbike motorcycle riders can fully break without fear of locking the wheels. At Honda, we believe that anyone should be able to operate a motorcycle’s brakes with complete confidence and peace-of-mind, no matter how poor road conditions may be. It’s the extra safety both experienced and novice riders want and need. After all, you never know what the road will throw your way – from wet streets to sand and other debris on the track. It helps make street bike motorcycle and supersport motorcycle riding more secure, and under normal operation, you’ll never know it’s there. But when you do need it, it’s always there to back you up. Brake with confidence when you ride the CB500F ABS. This machine stands alone as the top performer wherever you ride – from the short commute to the weekend trip curving through the mountains.